why are so many babies born around 8am? Silver award winner at Kantar's Information is Beautiful contest in the Science and Technology category! 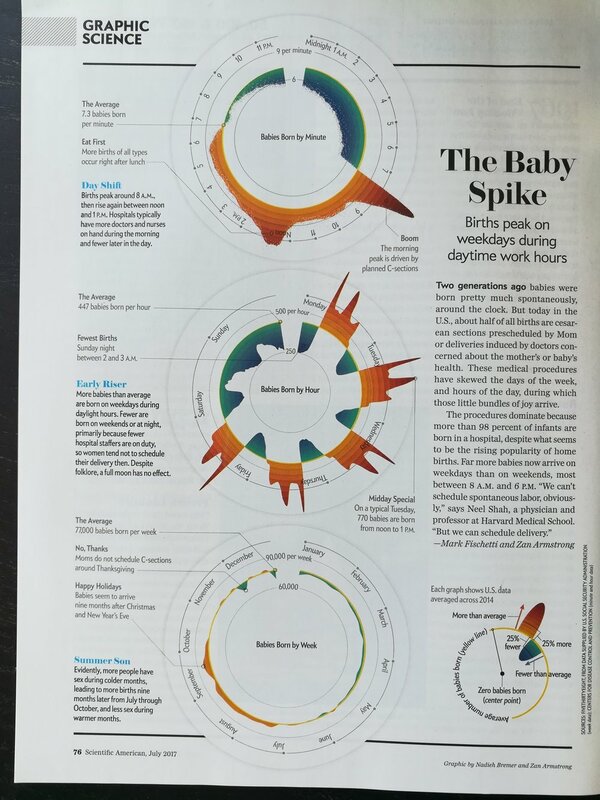 After my OpenVisConf presentation Everything is Seasonal, Amanda and Jen from Scientific American invited me to follow up on the baby birth seasonality part of the talk with an Graphic Science piece in Scientific American. I thought this would be a great opportunity to work on a project with Nadieh Bremer, so I invited her to collaborate on the visuals with me. In addition to the print piece, I wrote a blog post that showcases some of them more detail charts explaining why the minutely pattern is what is it. Hint: it has do with what types of births we can schedule and which ones we can't. Charts often aggregate across time to simplify the numbers. Instead, for this visual made for Scientific American, the focus has been on visualizing the number of babies born across different time frames; from weeks down to the minute, to reveal the role of scheduling & intervention in births. Nuanced insights about data design, visual form, and graphic design resulted in these unique charts that compare the birth of babies to the average. And people have much more influence than expected! Post on Scientific American's Blog. Web version of the print article. Article discussed on NPR blog. Submission in Kantar's Information is Beautiful showcase.